Of all the plumbing services we provide none of them would make any difference if you didn't already have the basics in place. The basics in any plumbing system involves the pipes, either the gas pipes that allow you to use your gas appliances and heat your homes or the water pipes that allow you to do your laundry and prepare meals for your family. When it comes to the safety of the gas and water lines supplying your home, you should only trust a licensed, professional plumber. Reno Plumbing Doctor’s licensed and bonded plumbers will inspect, repair, replace and/or install your water or gas lines to make sure that they are safe and cost effective for your home. There are many things that can go wrong with your pipes over time, plant roots may push at the pipe until a crack is formed and then before you know it the pipe has developed a major leak which will cause major damage and cost to you and your home. The same can happen with shifting soil or just general corrosion. In most cases a small repair may be all that is needed but in some case the problem is bigger which will require a partial or complete re-pipe of your home. There are many reasons why you might have low pressure, one reason could be if you have old galvanized plumbing with rust build up in the line. Replacing the galvanized pipes with copper will resolve the issue of the water pressure and the rust. When high pressure exists water may come out of your faucets too quickly and you will more than likely run out of hot water and also your water bill will probably increase drastically. The additional wear and tear on your fixtures will greatly reduce the life of the fixture. 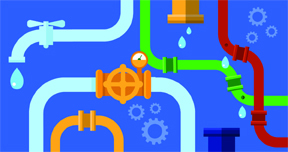 Reno Plumbing Doctor is one of the most trusted plumbing companies in Reno. We have built our reputation by offering expert Plumbing Services at affordable prices and always giving the best customer service. We promise to take great care of your home. Our gas and water line plumbing technicians wear shoe covers and put down drop cloths to protect your home. They’re trained to perform the work you need and will thoroughly clean up the work area.